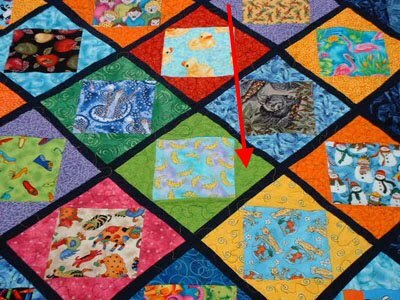 Welcome to Part 2 of "I spy Quilt Ideas" If you came here without visiting part one, be sure to go here to see Part one. 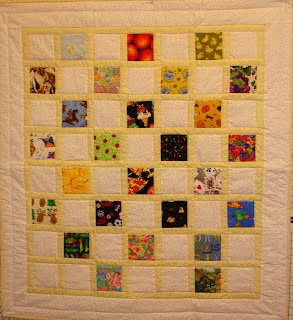 And don't forget to stop by to see "I spy quilt Ideas Part 3". Go to http://www.allpeoplequilt.com/ for many free patterns. 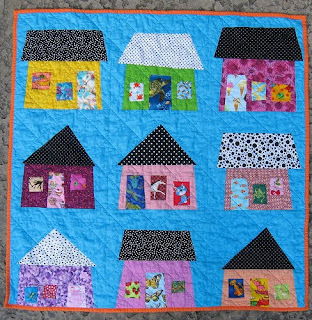 This little spy glass quilt is darling. I Spy a House - Why not put some fun I spy fabrics in the windows and doors. There's even a tutorial at this to make wonky houses. How about the popular jar quilt. Good for bugs and food charms. This ones comes from here I love the Jam Jar. There are many jar templates available and here's one to get you started, Scale down this jar pattern from About Quilting to use your 5 inch charms. 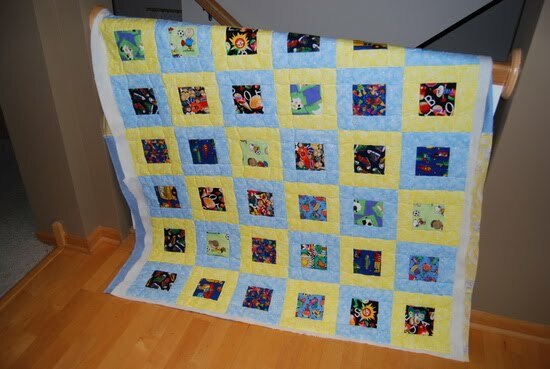 Who says I spy quilts have to be made into kids quilts. 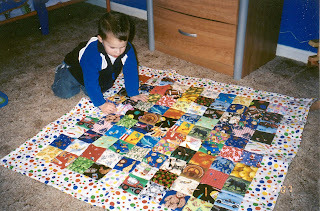 Why not make an I spy Table Mat. 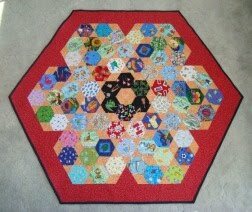 This hexagon shape is really nice. 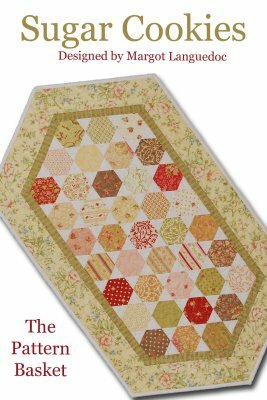 OR here's a free pattern called Sugar Cookies for a traditional shaped runner using 39 your I spy charms cut into hexagons. I Spy Diamonds. I didn't see a free pattern, but it certainly looks like a great layout. It also looks like it's "Quilt as you go" friendlyas well . How about a Happy Block I Spy quilt designed by Mary. Her free pattern for this quilt can be found here. 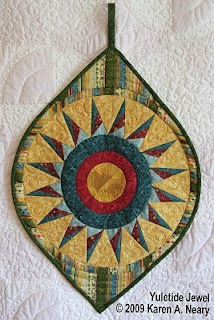 Or Mary's free Twisted Happy Block pattern can be found here. 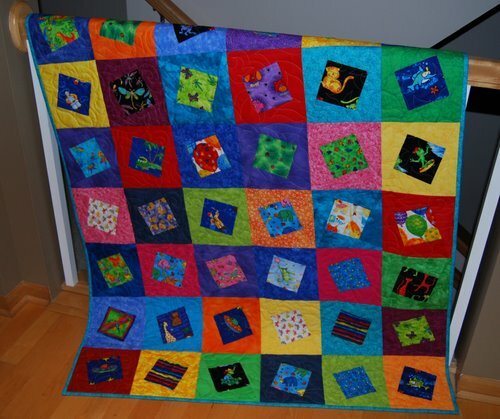 Scour your I spy stash packs to find 26 blocks and make an ABC quilt like this. Each block is for the letter of the Alphabet. 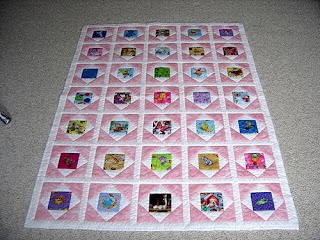 Make your 120 charms stretch into multiple quilts. 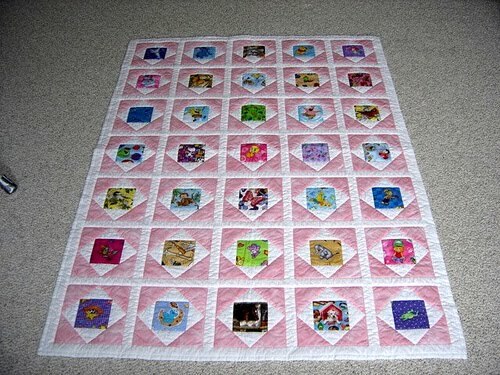 Use 35 charms for this quilt as you go, Box in a Box style. And for a scrappy look with many colors and an on point setting, you will have a very different look. "Find the Match" . How about an I spy with matching charm squares. Today was Treego day. 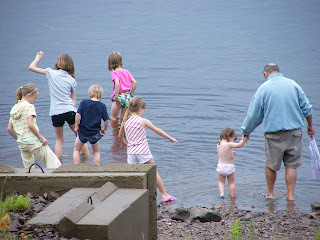 We packed a picnic, picked up the triplets, and off we went to Mactaquac park. We've been talking about going to Treego for weeks. Our scheduled day to go was yesterday but we got way too much rain and the Treego people called to cancel. So today is the day. Overcast weather and no rain. Perfect. 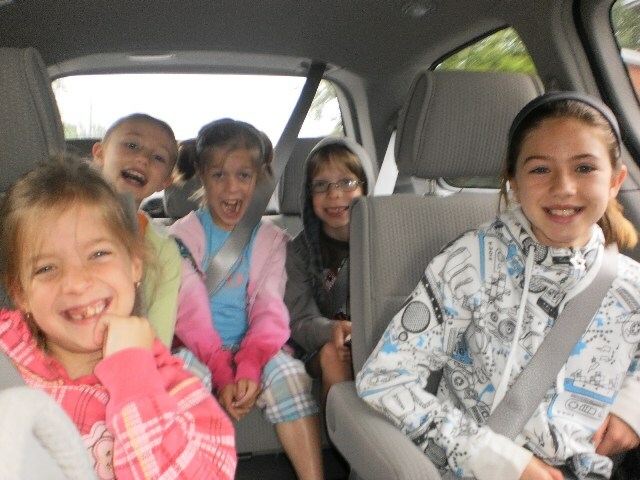 Do these kids look excited or what! After our picnic, we went to the Treego office and they had the kids sign a form. Then fit you with harnesses with safety cables and tell you all the rules. The kids got trained on the demo course. 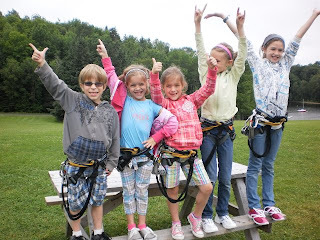 They learned how to clip the carabeeners on, how to link into the zip lines and how to manage traffic in the trees. "Clear" was the most important word. 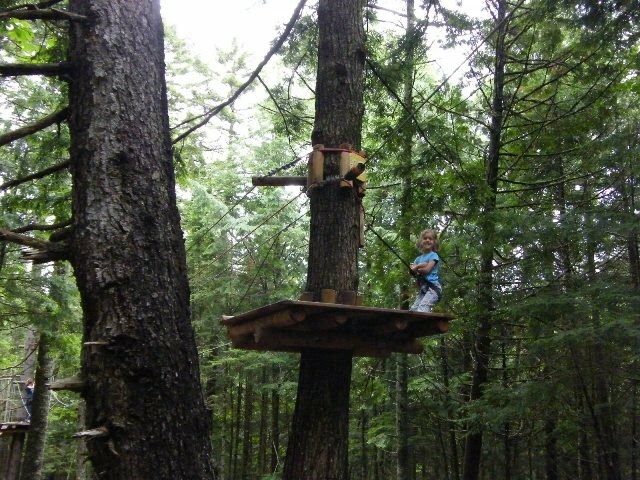 And to be rescued from the tree tops, you had to yell "Guide Guide Guide" . 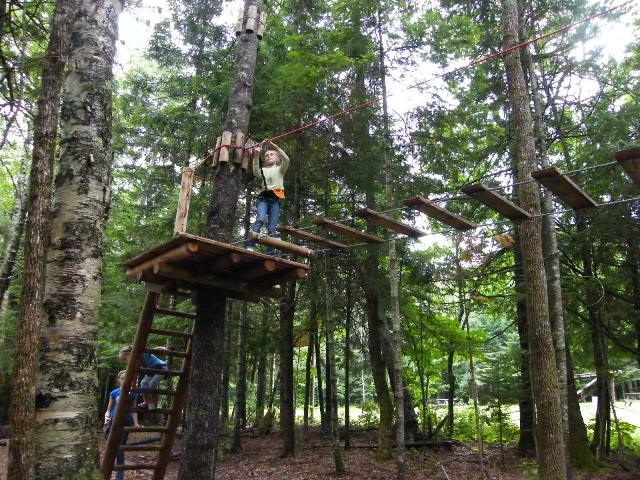 Don't the kids look ready to tackle those trees!! 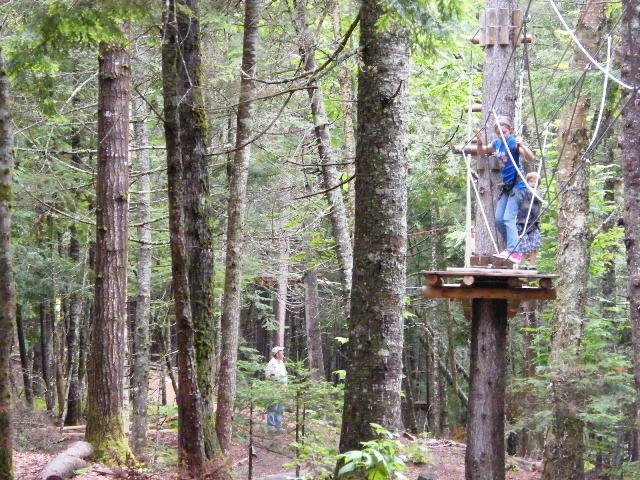 Now for the Trees. The pictures explain themselves.. 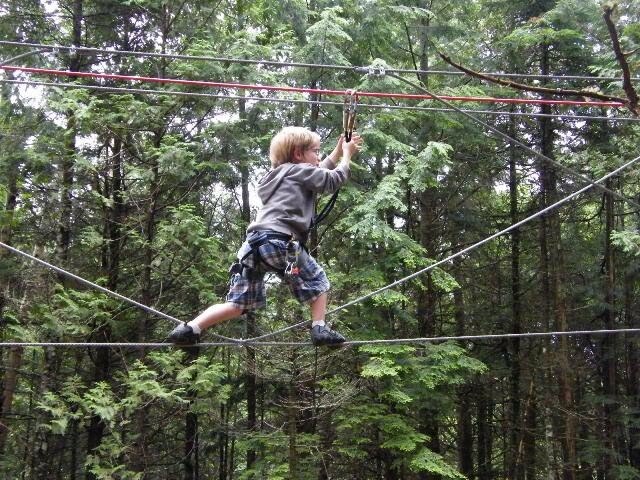 It was exhilarating for the kids. 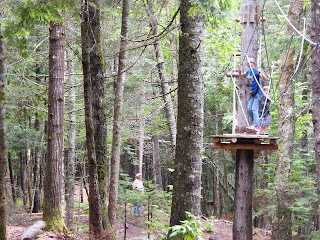 They did the course two times and it took two hours. Now that school is done, Jessica and Emily are here with me for a visit. 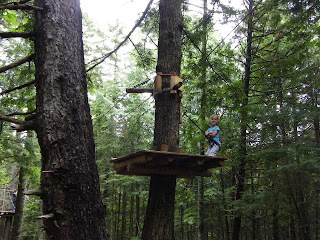 We intended to pick up the triplets and go to Treego today. But the rain came down too hard and the Treego people called to say, it's best to wait until tomorrow. 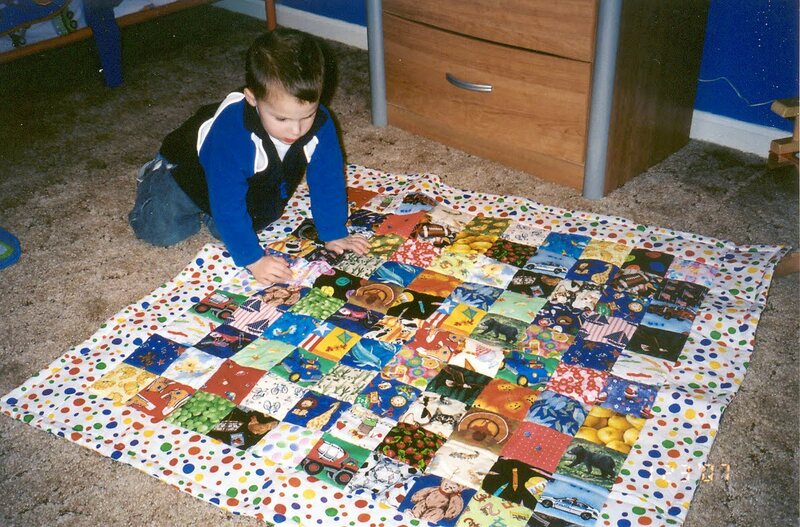 So instead, we sewed patches on their quilts.... many patches. I gave Jessica the job of counting patches in an I spy fabric swap that we're having. She counted all day. I think she'll dream of bugs, flowers, monkeys all night. The I spy patches were fun for her to look at. And we made Canada Day cookies with my new cookbook. 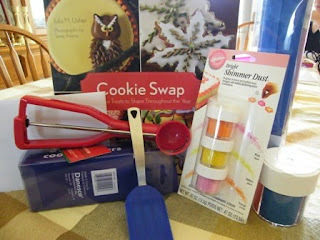 We made a sugar cookie recipe from my new "Cookie Swap" book that I got for my birthday. The kids said they were the best best best cookies they ever had, and they hadn't even been cooked yet. Yes, they were eating the dough. We cut out maple leaves, hearts, ducks, dog bones etc. They also cut out their name to make a special cookie for themselves. And we decorated, and over-decorated using some of the new techniques in the book. It's really to make spider webs and wavy lines in the cookies, just using a toothpick. After sewing patches, and making cookies, I made a pizza dough and then took a break. 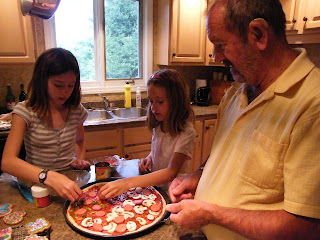 The girls made supper with Grampie. It was yummy. After supper we went to the Walmart to pick up a few things for our lunch tomorrow. 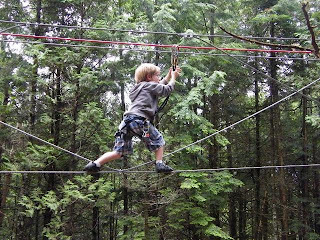 We're going to Treego, RAIN OR SHINE!! We're back home now, just relaxing and doing a few emails. Emily loves my netbook for chatting with Auntie Donna. They both loved sending emails to their mom. Even better, they loved getting emails back!! I've just had the best 3-day birthday! It all started out on Friday at our Friday Girls coffee break. Tracy H. presented me with a really fun "Cookie Swap" inspired birthday package. There was a great book that I have never seen before but I'd heard about it on a couple of baking blogs. And there was also lots of Wilton supplies to help me in my baking efforts. 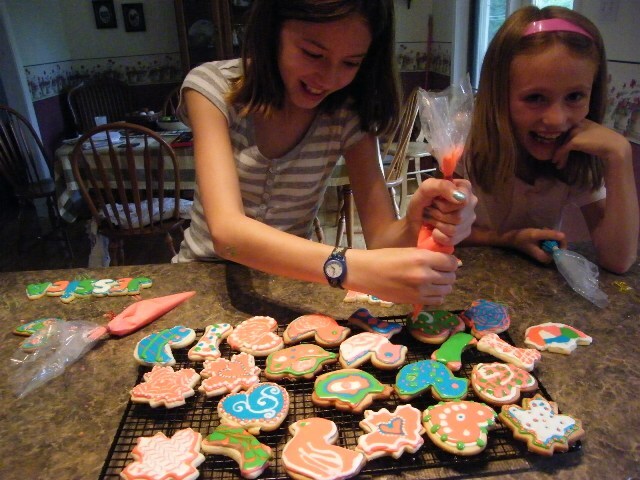 Decorating cookies with royal icing is my new thing. They are so nice...almost too nice to eat!! 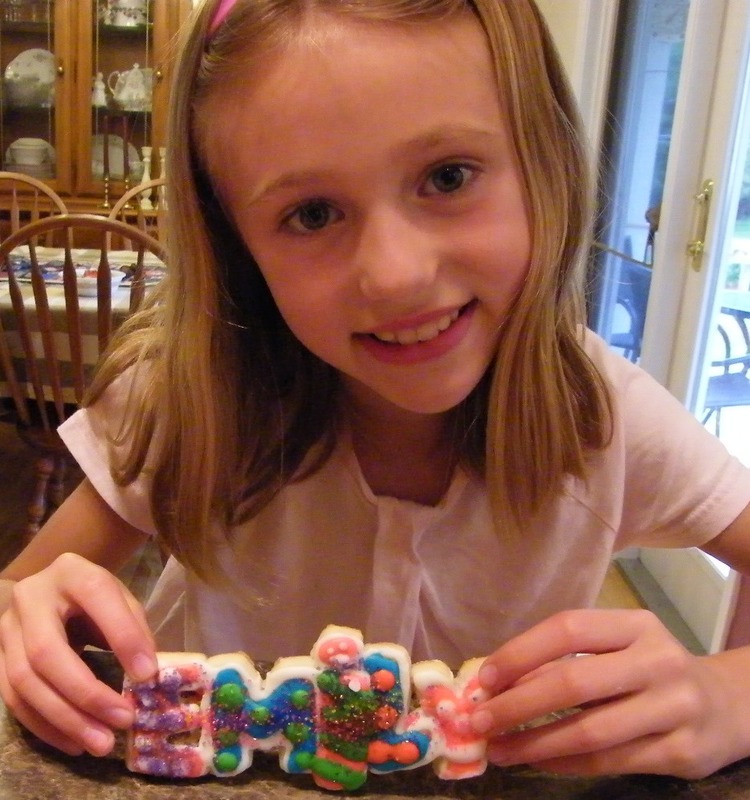 Watch for lots of cookies on celebration days from me and the kids this year. Many Thanks Tracy. It's a great gift. Then later on Friday, hubby took me away to the cottage where we spent a glorious weekend at the cottage. The rain that we were expecting never came. Just sun sun sun. 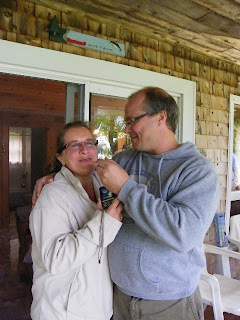 I received birthday calls from lots of people on Saturday and then hubby made me a really nice seafood birthday supper on Saturday evening. It was nice, just the two of us. Today when we got back from the cottage, Patience bought all the fixings for a salmon supper and she and Michelle cooked it for us. 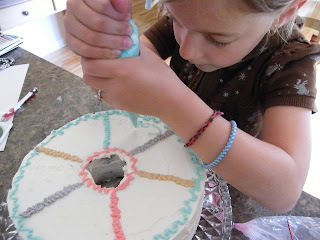 Patience is getting pretty good at decorating cakes. Don't you love this sunflower cake? 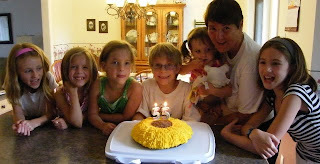 The kids helped me blow out the candles. A 3-day birthday.. who could ask for more!! It was an exciting day for Grace. 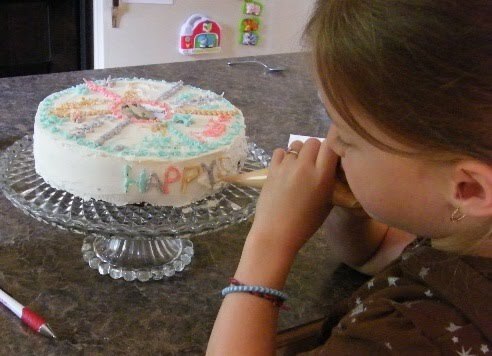 Today was the day she was going to decorate her Dad's Birthday cake all by herself. She decided on a Poker cake cause her dad really likes poker. 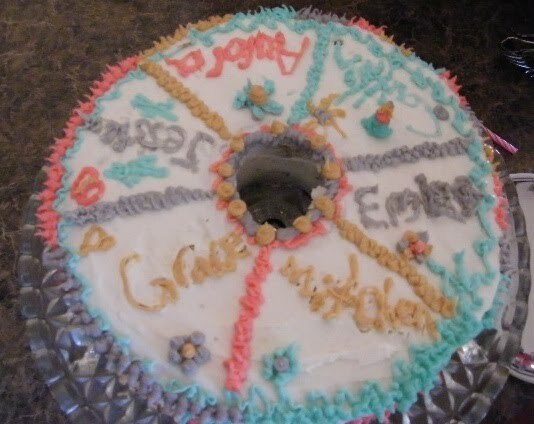 Grace chose all the specific designs, the green money, the red poker chips, the yellow faces, and some are sad, and on the sides, there's special writing on the side that says 41. Wonder Why? Happy Birthday Wade. Enjoy your cake! It's official. School is done for the year. Emily also participated in a closing event that had her doing a reading from the old days. We made her a hat and long skirt just like Little House on the Prairie. 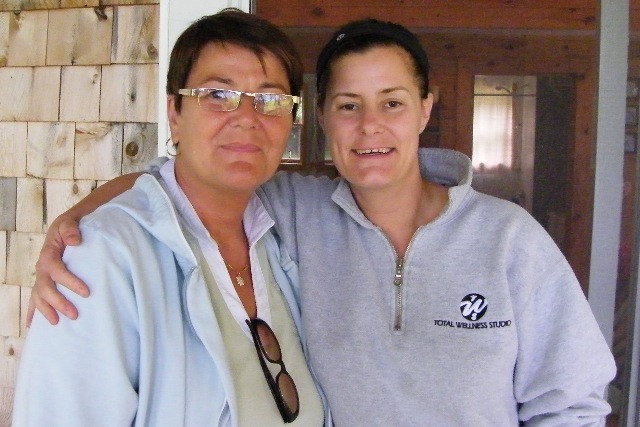 Here she is with her teacher. Doesn't she look authentic. Great Job Emily! I love the walking trails around our city. They are part of my life every day. I enjoy the fume free and noise free surroundings as I step along. Recently, they've paved a few of the trails and while some people are not happy because now they are less green, I don't mind. It's now a rare occasion that I have to stop and shake the rocks out of my sneakers. 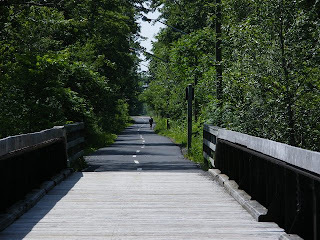 This is one of the newly paved trails and this week while walking I noticed that they had freshly painted lines. I wonder if the line painter is a quilter and they did this wobbly stitch on purpose.... I think I'll call this section of the trail, the Wobble Stitch Trail. I like it. Do you? I'm completely in between sewing projects. The warm days are definitely slowing down my sewing efforts. Although I do have a couple of projects that I'm preparing to work on. 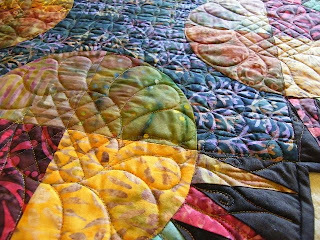 First I saw this great Goose quilt called "Flying Home" on the Miramichi Quilt Guild webpage that I just fell in love with. This will be a perfect quilt for my bed at the cottage. We watch flocks of geese often and love the nature of it all. I'm starting to collect fabrics I'll just start to sew this bed size quilt when I get all the fabrics. I've already started to sort through my stash to see what I have and what I need to buy. Next, I'm hoping some quilting blogger will have a Christmas in July challenge. If you know of one, let me know via comments. Although, I am going to sew a "Christmas in July" project one way or another. The project I have chosen is Karen's Yuletide Jewel. When I go to PEI after Canada Day, I intend to buy Christmas fabric for it. There's a quilt shop called "The Quilt Gallery" there. My favorite line of Christmas fabrics this year, is Fruitcake by Moda. I hope they have it. I've never been to the Mill River area of PEI, so I'm sure visiting this quilt shop will be one of the highlights. And for lack of anything else to sew right now, I sewed some nine-patches today. 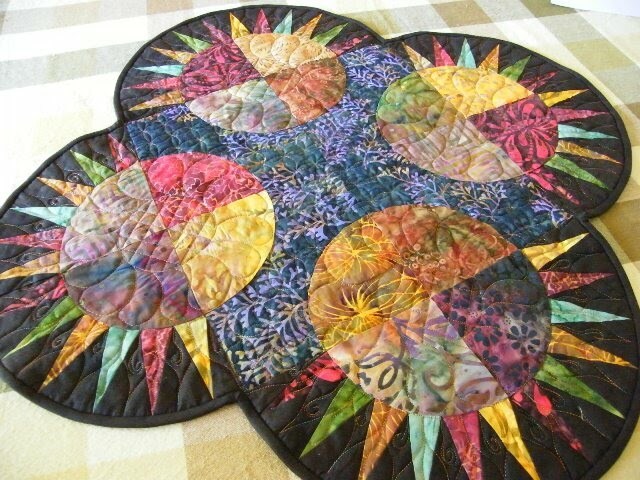 I'll put these together into 2 separate table runners like the one I've shown here. They'll be different colors than this one shown, depending on what's in my stash. I will use these as free-motion practice pieces. I want to really get to know how to do this very nice and versatile background free motion technique - McTavishing. The best one of the two runners will go to my sister. I hope to have both runners completed by the end of July when she comes through town. So, what are you planning to do this summer? Today was the school picnic for the triplets. 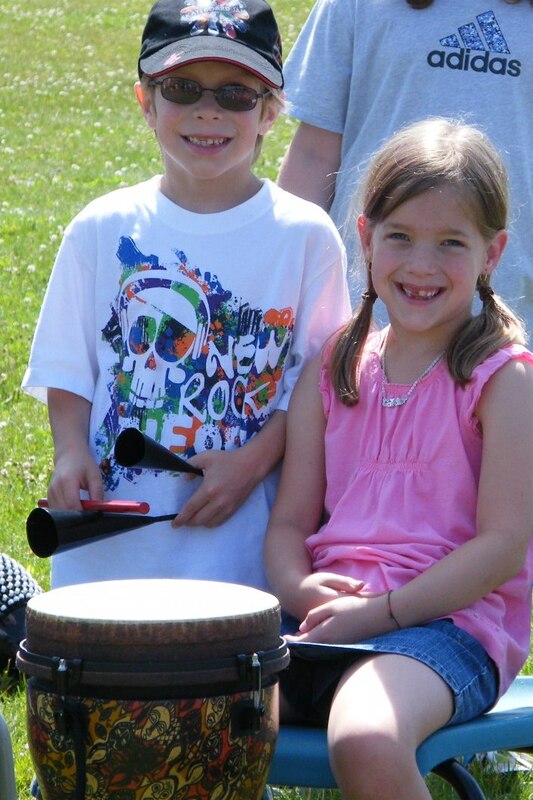 Mitchell and Caitlin were asked to participate in a Drumming Circle demonstration for all the students and parents. It was a demonstration of the equipment purchased for the music program. There were many sponsors attending to see how the drumming connected the kids. 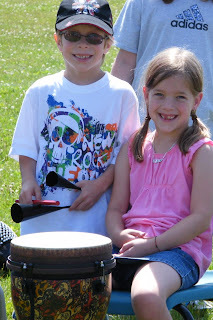 The drumming is very rhythmic. 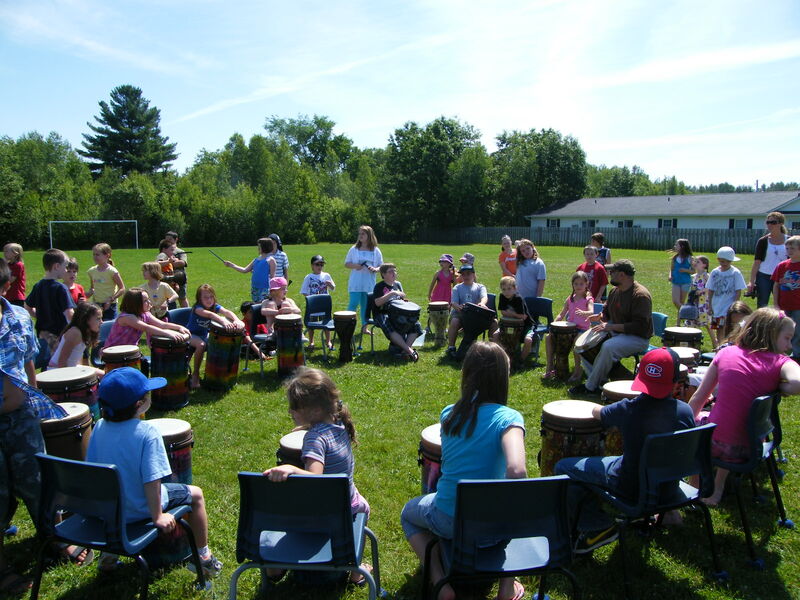 After the demonstration, the lead drumming coach invited all to sit and give the drums a try. Grace decided to give the drumming a go, so here she is with her brother and sister, along with the coach. I'm so pleased to show you my finished Dark Chocolate Beauty. This beauty, while it looks quite random, has a center of leafy batik greenery. The spikes have some coordinating green batiks which show off the beautiful golds and reds. I was sure that the free-motion quilting would not show up in the pictures, but I'm pleased that you can indeed see it. 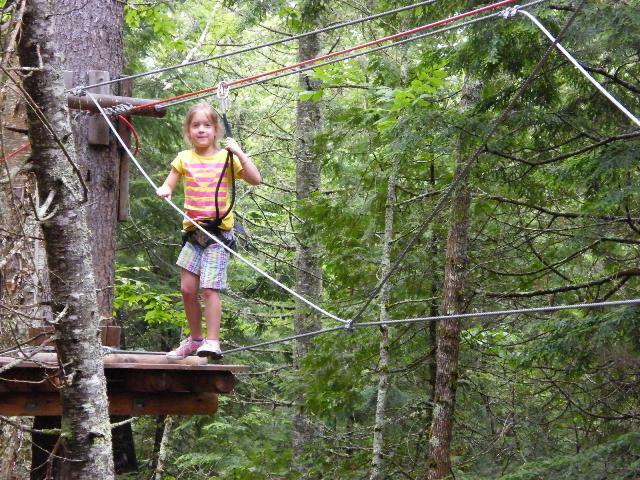 Next week, this Beauty will be going to my daughter Carrie who lives in Moncton. 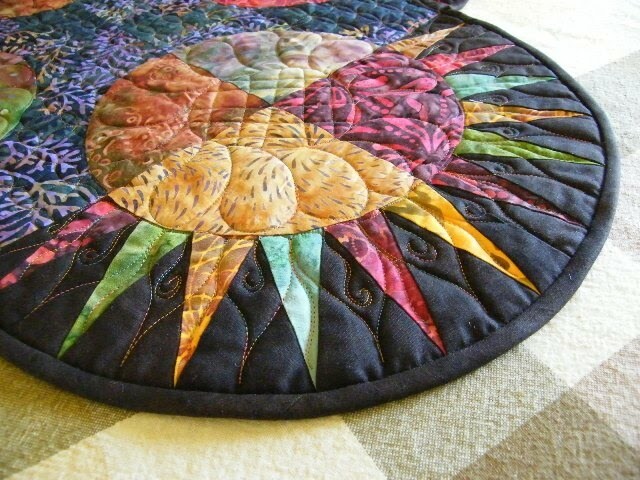 She has the perfect large round dining room table that this beauty will look lovely on. It's been a week of celebration. With Mert's Birthday and Father's Day, we've been partying and eating cake all week. For Father's Day, we all met at the cottage today and the girls brought lots of food and Father's Day wishes. Here's a special custom cake that Carrie and Michele had made. It's a golfer. It was so cute. It was hard to cut into because it was so cute. 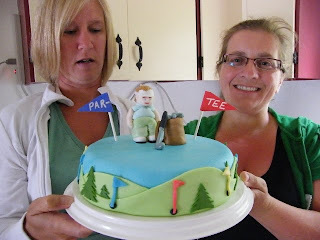 When we finally did cut into it, the kids all shared in eating the little golfer man and his golf bag. What fun it is to have all the kids around. 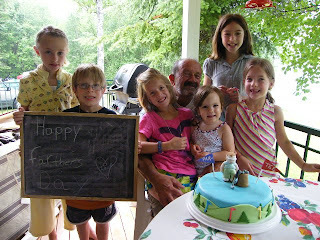 Mitchell even made a special Happy Fathers Day sign on the chalkboard. It's hard to see him, but Grampie is in there somewhere. Everyone is gathering around to watch the cake being cut. You see my grand kids all the time on my blog, but it's not often that you see my kids. So, let me introduce you. 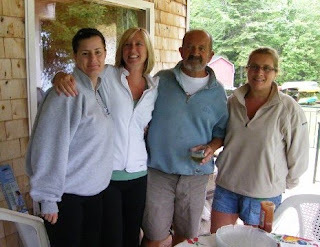 Here is Patience, Carrie, and Michele with their Dad. This is yours truly with Patience. She's the mom of Baby Aurora. Do you think we look alike? Everyone tells us we do. 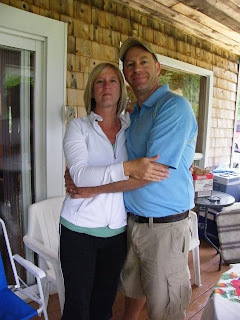 This is Michele and her husband Wade. 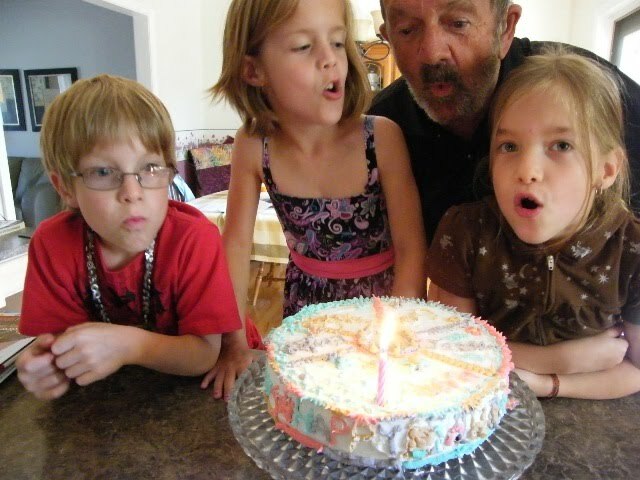 They are the parents of Caitlin, Mitchell and Grace, aka the triplets. Everyone thinks that Michele looks like me too. We just laugh! This is Carrie and her husband Kenny. They are the parents of Jessica and Emily. They'll be bringing their boat to the cottage soon and spending a couple of weeks vacation. Keep your fingers crossed for good weather. After a great dinner, Grampie and all six grandkids went down to dip their feet in the lake. 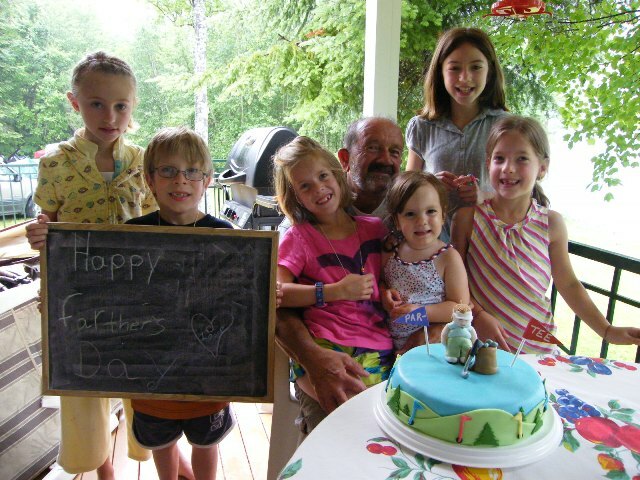 This was a great Father's Day and Grampie sure enjoyed all the attention. Caitlin has been thinking of how she was going to decorate Grampie's cake all week. Here she is with her plan. She picked out the colors. She decided it would be a Question and Answer Cake. The question would be wrote on the side of the cake. And the answer would be on top of the Cake. With icing, she divided the top of the cake into six sections. She carefully put the name of each of Grampie's grandchildren in each section. 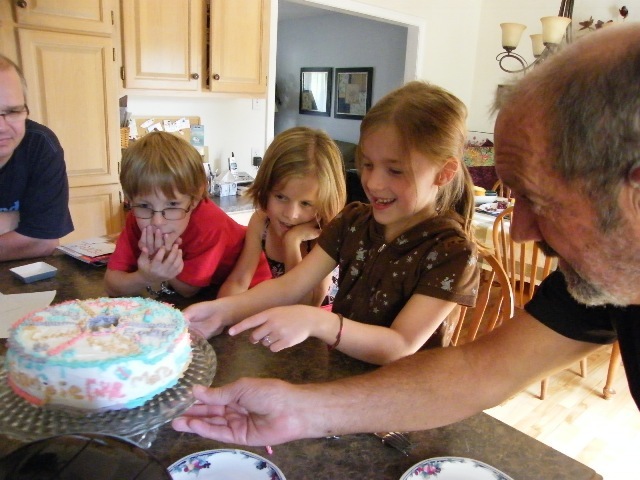 Then on the side of the cake, she wrote "Happy Birthday", and she put the question "What does Grampie like more than Golf? After we went out for a nice restaurant supper, we came home and we surprized him with his cake. Guess he needed help to blow out the candle. Of course everyone had to admire the cake writing. And here is the top of the cake. Great job Caitlin. 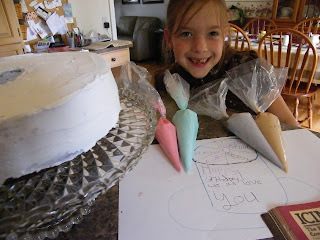 Next Friday, Grace is coming over to make a surprise cake for her Dad. She's got a couple of good ideas of what theme she will decorate his cake in. Be sure to drop by to see what she makes. Do you love all your threads?